ENGINE The 300 XC-W will reigns supreme, thanks to its all-new engine architecture with a new shaft arrangement for better mass centralization, a new cylinder with twin-valve controlled power valve, a new counterbalancer shaft for less engine vibrations, a new electric starter, a reworked 6-speed transmission and a hydraulically operated DDS clutch. This compact powerplant lays down the law in terms of 2-stroke power and torque and is the right choice for lovers of low purchase and maintenance costs. Oh, and of course don’t forget that 2-stroke symphony when you’re on the pipe. CYLINDER The newly developed cylinder of the 300 XC-W, with a bore of 72mm, has all-new ports and is fitted with a revised power valve system. This system features a sophisticated mechanism for the lateral support exhaust ports, providing smooth and controllable power on tap. Furthermore, it’s possible to change the bike’s power character in seconds thanks to two supplied powervalve springs. Limitless settings for different tracks and preferences are up for grabs. Throw everything you have at it; new water jackets in the cylinder and head will take care of excess heat and reworked lateral cylinder head brackets allow a more efficient fixation of the engine to the frame via two lightweight headstays. This is a serious piece of kit. ENGINE CASES These all-new die-cast engine cases feature an 8mm higher clutch shaft and a 27mm higher crankshaft position, resulting in better mass centralization, which improves handling. In addition, it allows the implementation of a counter balance shaft. So your ride will be as relaxed as it is rapid. Plus, your new favorite engine will keep looking as fresh as the day you bought it - redesigned engine covers feature a smart surface structure in order to reduce the wear caused by the rider’s boots. COUNTER BALANCE SHAFT Say goodbye to numb feet and hands. The new engine design created room for a lateral counter balance shaft in order to reduce the vibration level drastically, with 50% less vibes in the handlebar and foot pegs. You know what that means: more comfort, less fatigue and more miles. CRANKSHAFT Its 72mm stroke stayed, the rest is brand new. Rebalanced, revamped and set-up with a counter balance shaft to kill vibrations, not your vibe. Compared to the SX engine it has more inertia due to a heavier ignition rotor. This helps you feed in the power and provides maximum traction in places where you think all is lost. 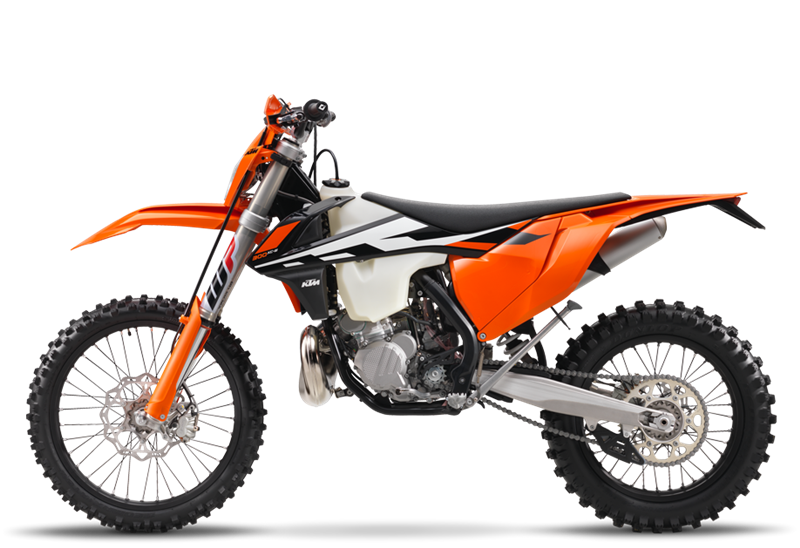 CARBURETOR As of model year 2017, all KTM 2-stroke models are fitted with new MIKUNI TMX carburetors, replacing the Keihin products. This 38mm flat slide carb lives to provide smooth and controllable power all the way up to the limiter. And it’s less sensitive to different altitudes and temperatures, so you can pin it wherever, whenever. ELECTRIC STARTER The 300cm3 2-stroke engine is equipped with a new electric starter, safely stowed away below the engine. Compared to its predecessor’s, its motor is less complex and much more reliable. And thanks to a powerful new lithium ion battery, this powerhouse will fire up time and time again. TRANSMISSION This reworked 6-speed Enduro gearbox has the same gear ratios as its predecessor, but our engineers took a close look at the mechanism in order to provide you with more precise and easier shifting. An advanced ´No Dirt´ gear lever design prevents mud or dirt build-up in the joint. Because even dirt lovers hate mud when it’s in the wrong places. CLUTCH The 300 XC-W employs the KTM-developed DDS clutch (damped diaphragm steel) with a wear-free steel basket and extremely heat resistant clutch plates. This clever design employs a diaphragm spring instead of the usual coil springs, making for considerably easier clutch action. A diaphragm spring also leaves sufficient space for a damping system to be integrated into the clutch hub. The goal is traction, but durability is as well. A lighter basket, a reworked inner hub and a pressure plate providing better oil supply and unsurpassed cooling up the longevity of the DDS clutch. Light operation and telepathic amounts of control are standard with this hydraulic Brembo actuated clutch. 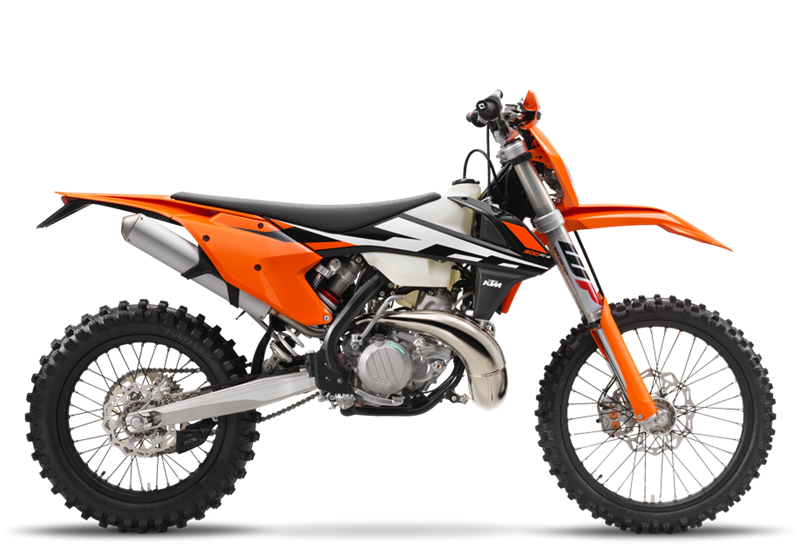 GRAPHICS New graphics convey the true READY TO RACE character of the 2017 XC-W model line. WHEELS The XC-W’s wheels feature lightweight, CNC machined hubs and high-end Giant rims guaranteeing maximum stability at minimum weight. The wheels are fitted with the latest Maxxis tires. The rear tire features a reworked profile and internal structure for better grip under wet conditions and is more resilient to punctures. Take them wherever you like, traction will be there. BATTERY & WIRING HARNESS This new engines is fitted with KTM’s proven electric starter – a unique KTM feature and a major benefit at all levels of racing. A super compact 495g lithium ion starter battery breathes life into the engine, shaving off two pounds of excess weight while offering three times the starting energy of a conventional battery. The battery and wiring harness are centralized in a compartment above the airbox, allowing the mechanic to remove the subframe without having to remove the electronics. A happy mechanic is a good mechanic.